Twenty years after the Battle of Hastings and the Norman take-over of England, William I (the Conqueror) commissioned an extensive survey of his new asset. As well as establishing the financial value of his land and therefore what levels of tax could be expected, it also records who owns what which was particularly useful for a King who needed to control the wealth and therefore the power of his closest nobles and their factions. Before he got himself a kingdom, William was a nobleman himself, so he well understood the machinations of influence and hierarchy. This survey has come to be known as the Domesday Book, because the survey results and the Final Judgement (due on Doomsday) shared a similar concept of an ultimate evaluation with no appeal. The survey was undertaken over 1086 and 1087. For Yorkshire the main elements recorded for each Vill or linked Vills*, were the number of carucates (a measurement of land based on what could be ploughed in a season), the number of plough lands (arable land i.e. the most valuable land), the number of plough teams (necessary to exploit the plough lands) and population, along with assigned values and sometimes measurements (based on lengths and breadth). *A Vill was not just a village, but an administrative unit smaller to the later Parish unit. 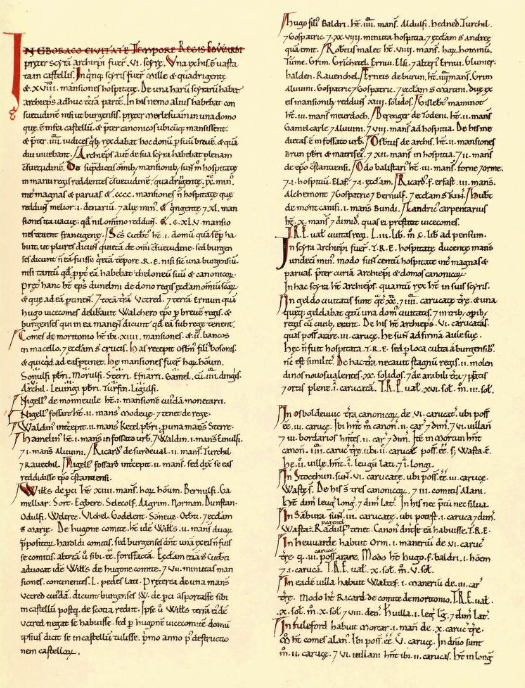 Inevitably the Domesday Book has lots of supposed inaccuracies, missing information, various approximations, and apparent misunderstandings and mistakes. To add to the confusion Anglo-Saxon codification was still being used alongside new Norman nomenclature as administrative terms. Nevertheless the Book provides a window in time from nearly 1000 years ago, however inaccurate some of the details. The comparison of Vill information provides an estimate of relative wealth. In the North York Moors area the obvious conclusion is that because of the large extent of ‘waste’ land and the very small populations recorded the area was relatively poor. There are large areas of the central moorland with no Vills and therefore information, because there was no habitation. This was inevitable because the moorland area could not be put to the plough and so was classed as ‘waste’ i.e. not used. There is also a paucity of information in many North York Moors entries e.g. few mills, scarce references to stock animals – this also suggests a lack of resources worth taxing compared with other areas of England. There are a number of Vills around the edges of the moorland, including along the coast, where there was either only ‘waste’ or partial ‘waste’ according to the Domesday survey. Shortly after William I became King of England the Normans carried out a military campaign in the north of England in the winter of 1069/70 to ensure all William’s new subjects definitely knew they had been subjugated – this is sometimes called the ‘Harrying of the North’. As well as the direct devastation of people and settlements, by destroying supplies, livestock, and cultivated land the indirect effects on the population from starvation were long lasting. In some Domesday Book entries the value of northern Vills is given as of c. 1066 as well as of 1086, and the decline in value (and population) is considerable. In Lid (Lythe) 2 carucates to the geld (measure of tax), and 1 plough could plough them. Swein had 1 manor there (pre Conquest). Now the Count of Mortain has it, and Nigel of him (sub-tenant with a Norman name). There are 6 villans with 1 plough, and 6 acres of meadow, woodland pasture 1 league long and 2 furlongs broad. The whole manor 11/2 leagues long and half a league broad. TRE (in the time of King Edward the Confessor as king, i.e. pre Conquest) worth 20s (shillings); now 5s6d (shillings and pence, note how much the value has gone down). In Golborg or Goldeburg (Goldsborough) 2 carucates to the geld, and there could be 2 ploughs. Swein had 1 manor there. Now Nigel (again) has it of the count. There are 16 acres of meadow (that’s a lot of potentially valuable land, as long as there are people to farm it). The whole manor 1 league long and a half broad. TRE it was worth 10s, now it is waste (If you’re going to lay waste its more effective to focus on settlements with a value, than on places that are already valueless). However it is worth noting that this ‘laying waste’ was not a new thing for the north of England, it had been going on intermittently for years, most recently at the hands of Scots and Vikings. It has also been suggested that the changes to the extent of waste around the North York Moors could be partly due to new landowners consolidating their wealth by re-distributing their working peasants in the 1070s and 1080s to make more of their best land, moving populations from the uplands to the lowlands. This could help explain why there is more plough land than plough teams in a number of locations. The Survey was only carried out as far north as the River Tees, which meant Yorkshire was the most northern county in the east and the North York Moors were right on the edge. Land further north was borderland subject to lawlessness and territorial conflict which often spilled out. The Domesday Book is divided up between shires (counties) and and beneath that the major (new) landowners, starting with the king at the top and then his barons and bishops below who had received gifts of land, the spoils of war, from the king as reward for their service and loyalty. It was very much all change at the top in the twenty years since the conquest, and this is obvious in the proliferation of the Norman sounding names of major landowners. Below the barons and bishops were local under-tenants. Very occasionally there is a local under-tenant still with Anglo-Saxon or Viking sounding name in the North York Moors. In Childale (Kildale), Ligulf had (pre Conquest) 6 carucates of land to the geld, land for 3 ploughs. Orm (this is a Viking name) has 1 plough there, and 8 bordars with 2 ploughs. There is a priest and a church. 2 leagues long and 1 broad. TRE worth 16s; now 20s. (Note that the value of the Kildale Vill has actually increased since 1066 which suggests it had avoided being attacked). As well as plough land, there was also value assigned to woodland which in the North York Moors was mostly silva pastilis i.e. wood pasture. It’s worth noting that the Domesday Book doesn’t provide the area of woodland in England, it’s only interested in managed woodland. However it’s interesting now to see where there was woodland – for instance the record for the Vill of Crunkly in the Esk Valley (now Crunkly Gill) contains considerable woodland, alongside a small population and plough lands – Crunkly Gill is now renowned for its Ancient Woodland. There was some ‘meadow’ around the North York Moors, particularly along the edges, valuable for hay and for grazing. There is also reference to scrubland which at least provided some resource compared to waste. In Elmeslac or Almeslai (Helmsley). Uhtraed had 1 manor of 8 carucates to the geld, and there could be 4 ploughs. Now the count has there 6 villans with 2 ploughs. There is a priest and a church, woodland pasture and arable field 6 leagues long and 11/2 leagues broad. TRE worth 32s; now 10s (the value has declined considerably but it’s still relatively valuable and the presence of the arable field and people/ploughs will potentially bring the value back up soon enough). Population numbers, including plough team numbers, were very important from a point of view of property and wealth. Working people (villans, bordars who all owed labour to their overlord) were vital for turning land into yield. There are also sokeman and soke land, a sokeman was a kind of freeman, more prevalent in previously Viking controlled areas like the north of England, but they still owed labour to their overlord. The Domesday Book looks to the future as well as noting past ownership, in an area like the North York Moors which was currently low value it often refers to the numbers of ploughs there could be. The Normans were here for the long term. In Begeland (Old Byland). Eskil had 6 carucates of land to the geld, where there could be 3 ploughs. Now Robert has 1 plough there; and 7 villans with 2 ploughs. There is a priest and a wooden church. TRE it was worth 20s; now 16s. A number of ‘newer’ villages/vills in the North York Moors don’t feature in the Domesday Book, including Rievaulx, Broxa, Silpho, Goathland, and Westerdale, which all have later mediaeval origins. There are also a number of Vills whose population and importance subsequently shrunk, disappeared or was subsumed, such as Ardene (Arden), Rauenstorp (Ravensthorpe), Morton (Murton), and Griff. However a lot of the Vills can still be recognised in parish and village names today – even if the spelling looks different, try saying the Domesday name out loud. In Witebi (Whitby) and Sneton or Snetune (Sneaton), a Berewick (an outlying holding considered part of the Manor), are 15 carucates to the geld, and there could be 15 ploughs. Earl Siward (Viking Earl of Northumberland) held this as 1 manor. Now Earl Hugh has it, and William de Percy of him (de Percy’s feudal overlord was d’Avranches, but a few generations later it would be the de Percy family who will be given the very important Earldom of Northumberland). In demesne (land directly part of the manor) 2 ploughs; and 10 villans and 3 bordars having 1 plough. Woodland pasture 7 leagues long and 3 leagues broad. The whole of the open land 3 leagues long and 2 broad. TRE worth £112 (a large amount of money); now 60s. To this manor belongs the sokeland (wider land holdings): Figclinge or Figelinge or Figlinge (Fyling), 1 carucate; Nortfigelinge (Fylingthorpe), 5 carucates; Ghinipe (Gnipe Howe), 3 carucates; Presibi (part of Whitby), 2 carucates; Ugleberdesbi (Ugglebarnby), 3 carucates; Sourebi (part of Whitby), 4 carucates; Brecca (part of Whitby), 1 carucate; Bauldbyes (part of Whitby), 1 carucate; Flore or Florum (Flowergate – part of Whitby), 2 carucates; Staxebi (High Stakesby), 2 carucates and 6 bovates (a bovate is one eighth of a carucate); Neuhuse (Newsholm), 4 carucates. In all 28 carucates and 6 bovates to the geld, and there could be 24 ploughs. Earl Hugh has this, and William of him. Nearly all waste. Only in Prestebi and Sourebi which the Abbot of York has of William, are there 2 ploughs in demesne, and 8 sokemen with 1 plough, and 30 villans with 3 ploughs, and 1 mill 10s (probably a corn mill), and 26 acres of meadow, in places. This entry was posted in Historic Environment, Local Community, North York Moors and tagged History, Mediaeval by North York Moors National Park. Bookmark the permalink.